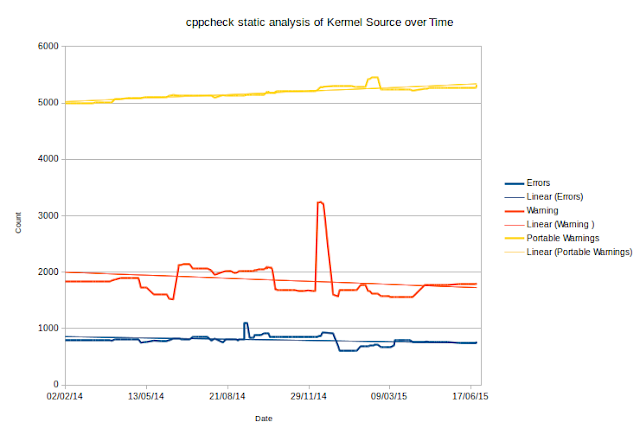 Since 2014 I have been running static code analysis using tools such as cppcheck and smatch against the Linux kernel source on a regular basis to catch bugs that creep into the kernel. After each cppcheck run I then diff the logs and get a list of deltas on the error and warning messages, and I periodically review these to filter out false positives and I end up with a list of bugs that need some attention. Bugs such as allocations returning NULL pointers without checks, memory leaks, duplicate memory frees and uninitialized variables are easy to find with static analyzers and generally just require generally one or two line fixes. So what are the overall trends like? Warnings and error messages from cppcheck have been dropping over time and "portable warnings" have been steadily increasing. "Portable warnings" are mainly from arithmetic on void * pointers (which GCC handles has byte sized but is not legal C), and these are slowly increasing over time. Note that there is some variation in the results as I use the latest versions of cppcheck, and occasionally it finds a lot of false positives and then this gets fixed in later versions of cppcheck. Comparing it to the growth in kernel size the drop overall warning and error message trends from cppcheck aren't so bad considering the kernel has grown by nearly 11% over the time I have been running the static analysis. Since each warning or error reported has to be carefully scrutinized to determine if they are false positives (and this takes a lot of effort and time), I've not yet been able determine the exact false positive rates on these stats. 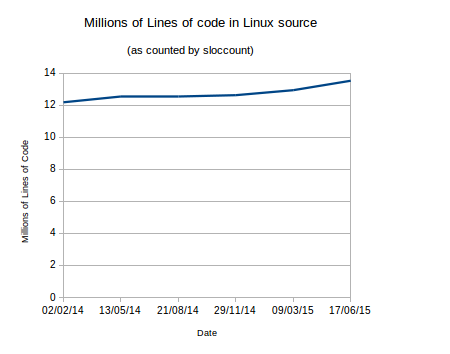 Compared to the actual lines of code, cppcheck is finding ~1 error per 15K lines of source. It would be interesting to run this analysis on commercial static analyzers such as Coverity and see how the stats compare. As it stands, cppcheck is doing it's bit in detecting errors and helping engineers to improve code quality. Last night I was mulling over an overheating laptop issue that was reported by a user that turned out to be fluff and dust clogging up the fan rather than the intel_pstate driver being broken. ..e.g. in this case, the fan is clogged up. Fortunately, laptops invariably provide Thermal Zone information that can be monitored and hence one can correlate CPU activity with the temperature of various components of a laptop. So last night I added Thermal Zone sampling to powerstat 0.02.00 which is enabled with the new -t option. Running for 60.0 seconds (120 samples at 0.5 second intervals). Power measurements will start in 0 seconds time. ..the -t option now shows x86_pk (x86 CPU package temperature) and acpitz (APCI thermal zone) temperature readings in degrees Celsius. One can see that the CPU frequency (green) scales with the the CPU load (blue) and so does the CPU power (orange). CPU temperature (yellow) jumps up quickly when the CPU is loaded and then steadily increases. Meanwhile, the ACPI thermal zone (purple) trails the CPU load because it takes time for the machine to warm up and then cool down (it takes time for a fan to pump out the heat from the machine). So, next time a laptop runs hot, running powerstat will capture the activity and correlating temperature with CPU activity should allow one to see if the overheating is related to a real CPU frequency scaling issue or a clogged up fan (or broken heat pipe!). A while ago I blogged about Brendan Gregg's excellent book for tracking down performance issues titled "Systems Performance, Enterprise and the Cloud". Brendan has also produced a useful I/O diagnostic bash script iosnoop that uses ftrace to gather block device I/O events in real time. Tracing block I/O. Ctrl-C to end. A useful I/O analysis tool indeed. For more details, install the tool and read the iosnoop man page. The above example shows that my Ivybridge i5-3210M spent ~75% of the time in the deepest C7 sleep state and ~22.5% of the time in the fully operating C0 state. A new -f option gathers CPU frequency statistics across all the on-line CPUs and displays the running average. 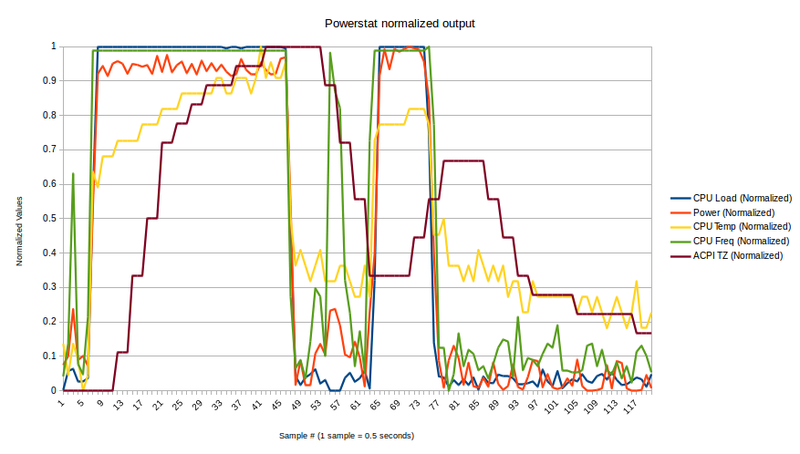 This provides an "instantaneous" view of the current CPU frequencies rather than a running average between the last sample, so beware that just gathering statistics using powerstat can cause CPU activity which of course can change CPU frequency. One can easily see the correlation between CPU Frequency, CPU Load and CPU core power consumed just from the powerstat data. Powerstat tries to be as lightweight and as small as possible to minimize the impact on system behaviour. My hope is that adding these extra CPU instrumentation features adds more useful functionality without adding a larger system impact. I've instrumented powerstat with perf and I believe that the overhead is sufficiently small to justify these changes. These two new features will be landing in powerstat 0.01.40 in Ubuntu Wily.